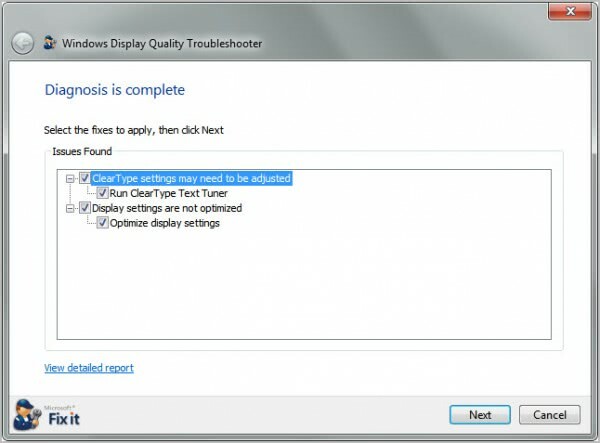 Microsoft Support has released a new Fix-It solution to fix Windows display quality issues. A Fix-It is a small portable program that can resolve common Windows issues automatically. Each Fix-It offers to resolve issues that it finds automatically or give the user the option to select the fixes manually. The second option is usually the recommended one as it gives users more control over the troubleshooting process and repair. The display quality Fix-It is available as an app that downloads needed files from the Internet and as a portable version. When you start the program the following screen is presented to you. 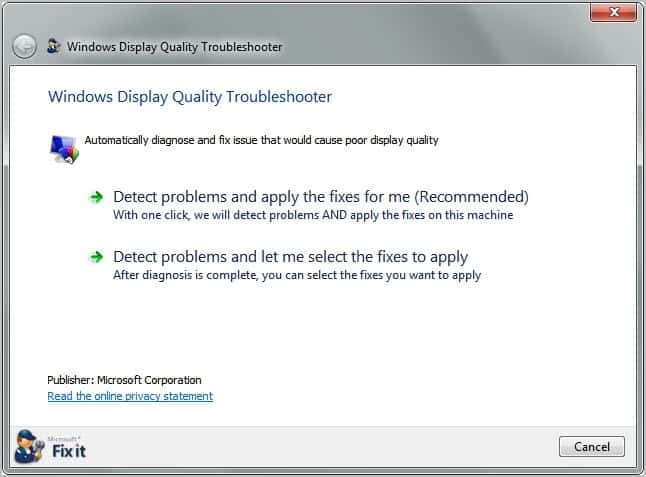 I’d recommend to select Detect problems and let me select the fixes to apply to avoid additional issues that the troubleshooter may cause. The Windows Display Quality Troubleshooter analyzes the system and displays fixes after the diagnosis has been completed on the next screen. Here it is then possible to run some or all of the fixes if the manual option has been selected. It is also possible to display a detailed report that displays all issues that the Display Quality Troubleshooter checks for. The troubleshooting tool runs all selected fixes to resolve display quality issues in the Windows operating system. Depending on the issues, wizards may be displayed that walk the user through the configuration or fine tuning of a feature. This is for instance the case if Clear Type settings appear not to be adjusted. This entry was posted on Monday, November 21st, 2011 at 10:35 am	and is filed under tech tips. You can follow any responses to this entry through the RSS 2.0 feed. Both comments and pings are currently closed.